What is Monster Khaos energy drink? Monster Khaos energy drink is a 'Juice Monster', which is made from a base of the Monster flavor with a potent cocktail of juices such as apple, orange, peach, tangerine, pineapple and white grape. Few things to note- these aren't actual juices, but juice concentrate, so make of that what you will- concentrate usually does have other chemicals and sugars added to it, so concentrate is definitely not as healthy as regular, fresh juice. It also seems like they've literally added in every single fruit that's on the color wheel of orange and yellow, hence the also matching orange print outside that covers the can. There is another Monster Juice flavor, called 'Monster Pipeline Punch', and that combines passionfruit, orange and guava. Where is Monster Khaos energy drink made? Monster Khaos energy drink is made in the good old USA, by the Monster Beverage Corporation. Monster Khaos is also available in other countries all over the world if you're craving your favorite energy drink fix while on vacation. Monster Khaos.. yes, chaos spelt with a K.
It is not a significant source of calories from fat, saturated fat, trans fat, cholesterol, dietary fiber, vitamin A, vitamin C, calcium and iron. There is a lot of fruit concentrate in here, which also comes with its own natural sugars in addition to glucose that has been added to the drink. It serves to say is that Monster Khaos has a lot of juice in it. 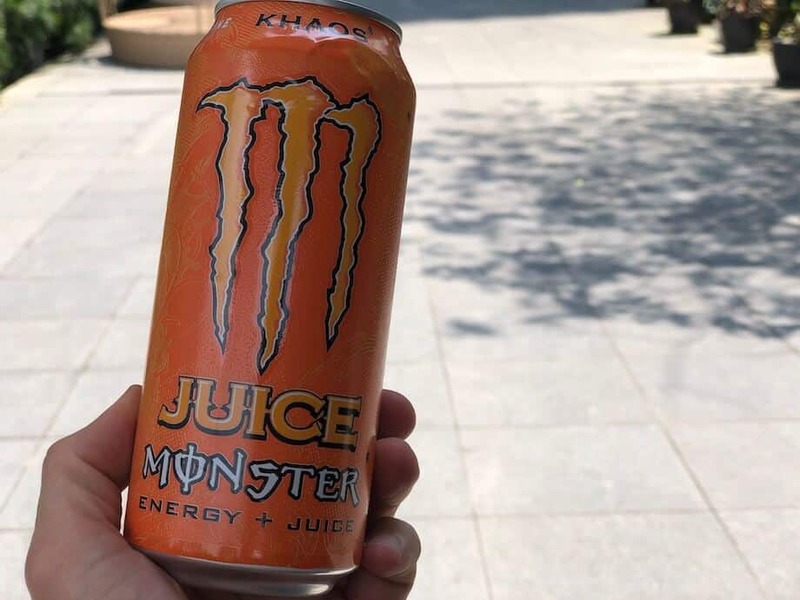 Monster Khaos contains 154mg of caffeine, which is little over a quarter of the daily recommended caffeine limit for an adult individual (400mg). If you're drinking an energy drink from the Monster line, make sure you're also aware of the other caffeinated substances you're consuming in order to make sure you don't overdo it on any one day. As usual, pregnant women and women who are breastfeeding should not consume this drink, nor should children under the age of 18 or those extremely sensitive to caffeine. You probably should not drink this everyday in my opinion, for health reasons- caffeine and otherwise. Monster Khaos- nutrition facts on the back of the can. A 4 pack of 16 fl.oz Monster Khaos costs $15.26, so that means a single can is $3.80, excluding shipping. If you're interested, Monster Pipeline Punch is also around the same price, at 40¢ less- $3.40, excluding shipping as well. This price is admittedly a lot higher than the regular Monster drinks, but this is probably because a lot of juice concentrate is added, rather than artificial flavors. That's a point in Monster Khaos' favor for me, but exactly how much of the drink is juice concentrate? If you're not willing to pay such a high price for an energy drink, check out REIZE- it's a powdered energy drink that is easy to make, efficient, delicious and ships directly to your door for around $1 per drink. Where to buy Monster Khaos energy drink? You can get Monster Khaos energy drink online at Amazon as usual, where they come in packs of 4. Pipeline Punch is also available there if you'd like to try that flavor too. For those looking to buy in bulk, try Ebay instead, where you can get a 24 pack of Monster Khaos. 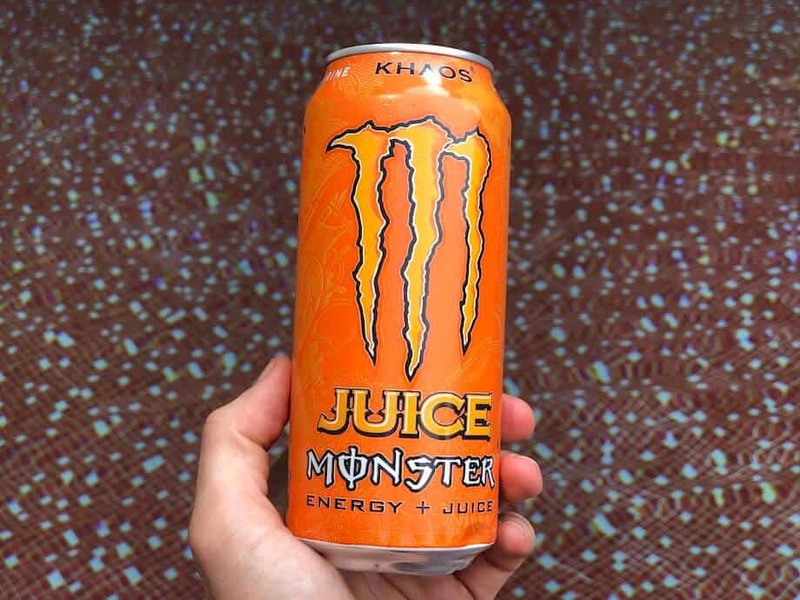 Other than that, you can find Monster Khaos in regular stores as well, such as Walmart, Costco, Target, and most gas stations scattered across the US. Monster Khaos contains 154mg of caffeine per 16 fl.oz can, regular Monster is similar, with 179mg of caffeine / 16 fl.oz. Monster Khaos has a lot less caffeine than Monster, but this is perhaps because of the extra juice and sugars already added to it, which is where some of the energy boost comes from. Or maybe they're just trying to make the Monster Khaos seem healthier? Monster Khaos contains 37g sugars per 16 fl.oz, and regular Monster has slightly more, at 52g of sugar / 16 fl.oz. Monster Khaos definitely has a lot less sugar than regular Monster, but this is still a pretty significant amount. Drinking this over a long amount of time could cause tooth decay and possible stomach issues because of the sweetness and acidity. Monster Khaos costs $3.80 for a single can, while it is $37.95 for a 12 can pack of Monster Import energy drinks on Amazon, which means that it's around $3.20 for a can, excluding shipping. Monster Khaos is slightly more expensive than Monster, so I would say it's really up to you, your budget and your preferences here. Do you like juice or something with a bit more flavor punch? 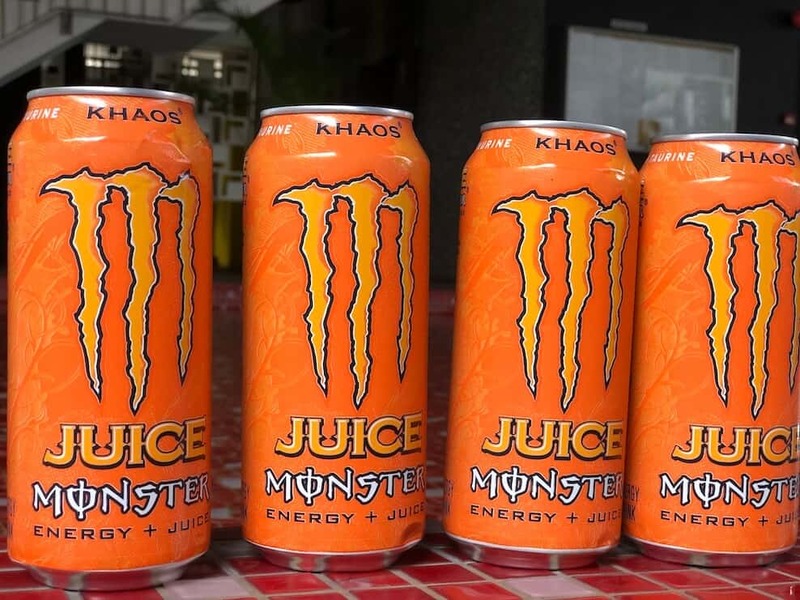 Monster Khaos is quite a bit more expensive than a regular Monster drink, but I think it's worth it if you're a huge juice fan. Monster Khaos contains 154mg of caffeine per 16 fl.oz can, while Red Bull only has 80mg of caffeine / 8.4 fl.oz. Red Bull has half the amount of sugar that Monster Khaos does, but it does come in a smaller can. Two cans of Red Bull would be roughly equivalent to a single Monster Khaos' caffeine content, but not quite the same amount of fluid ounces! Monster Khaos contains 37g sugars per 16 fl.oz, which is similar to Red Bull, which contains 27g of sugar / 8.4 fl.oz. Monster Khaos and Red Bull are actually about the same level of sweetness, which is an improvement, considering that Red Bull is usually only half as sweet as a regular Monster drink with 50+ grams of sugar. However, 37g and 27g of sugar is still over the recommended daily sugar limit though (25g for women, 38g for men). Monster Khaos costs $3.80 for a single can, while Red Bull only costs around $1.99 per can. Monster Khaos is far more expensive (almost twice the price!) of Red Bull, and overall, does not have as strong an effect as Red Bull, so I think Red Bull here has more value for money than Monster Khaos does. Monster Khaos contains 154mg of caffeine, and Bang has nearly double that at 300mg of caffeine / 16 fl.oz. Looking at the caffeine content, it seems that Bang would be a lot more effective than Monster Khaos, but this is only true for those who find caffeine to be the most effective way to get an energy boost. Personally, I think it's the combination of ingredients that results in the boost I get from an energy drink. Pure caffeine doesn't work very well on me. Therefore, I'm not willing to say that more caffeine always equals a bigger boost, although, that may be true for you. Monster Khaos contains 37g sugars per 16 fl.oz, but Bang energy drink has 0g sugar. Monster Khaos doesn't state that it uses artificial sweeteners, but it does contain natural sugars such as glucose. So, in this respect it's actually better than Bang in my opinion, which relies completely on artificial sweeteners like sucralose and acesulfame potassium in order to gain its signature overly-sweet taste. Monster Khaos costs $3.80 for a single can, while Bang costs much less, at $2.17 per can. Monster Khaos is a lot more expensive, but it does have the benefit of using juice rather than artificial flavors and sweeteners. But, the heart of the matter is that it depends on your individual body chemistry- do you react better to caffeine? Are you looking for a boost that is strong but isn't that strong? What other options do you have? Keep all that in mind as you decide which drink is best for you. Monster Khaos energy drink is pretty expensive, at nearly $4. Monster Khaos contains 154mg of caffeine per 16 fl.oz can, while REIZE only has 50mg of caffeine. Even though REIZE has so much less caffeine, it makes up for it by having 1000mg of taurine, a naturally occurring amino acid that has been known to produce good, clean energy, and without any unpleasant side-effects. Monster Khaos relies heavily on caffeine and sugar, both of which aren't very helpful to the body in the long run if consumed in excess. Monster Khaos contains 37g sugars per 16 fl.oz, and REIZE is completely sugar free. REIZE does contain artificial sweeteners, but these have been extensively tested- acesulfame potassium and aspartame, the same ingredients used to sweeten Coke Zero Sugar and many other common drinks and food. Monster Khaos does contain sugar, glucose, but it's not very forthcoming as to what other artificial sweeteners or otherwise are in the fruit concentrates themselves. Monster Khaos costs $3.80 for a single can, while REIZE is a lot cheaper, at only around $1 per sachet, which can make a 8 fl.oz drink. In addition to that, REIZE is fully customizable, and you can control how much energy you need with each drink. If you're looking for efficiency and ease to carry around, REIZE is a great choice because it comes in small, light and easy to transport packets as opposed to the massive size of the Monster cans. REIZE is also a lot less sweet, so that will be great for people on diets or wary about consuming too much sugar. First thoughts- an orange can? An interesting departure from the usual black and neon colors, and it looked a lot more bright and cheerful than the usual black. It was a regular sized can, so 16 fl.oz. There was 'juice' emblazoned across the front, so that means that it was made using real juice, something that their marketing is based around, naturally. Surprisingly, I would say it's one of the best in the Monster line- it's not as sweet or with a bad tasting after taste as the others in the Monster energy line, and it's bolstered by the juice combination. But even though it's not as sweet, it's definitely extremely sweet, due to all the juice concentrate in there. If you want something that errs on the side of health, try REIZE instead, which doesn't contain nearly as much sugar. I would say that this isn't as strong as other Monster drinks, but it does the job. You get an energy boost, but you don't quite get the big crash as other, much more sweetened Monster drinks give you. 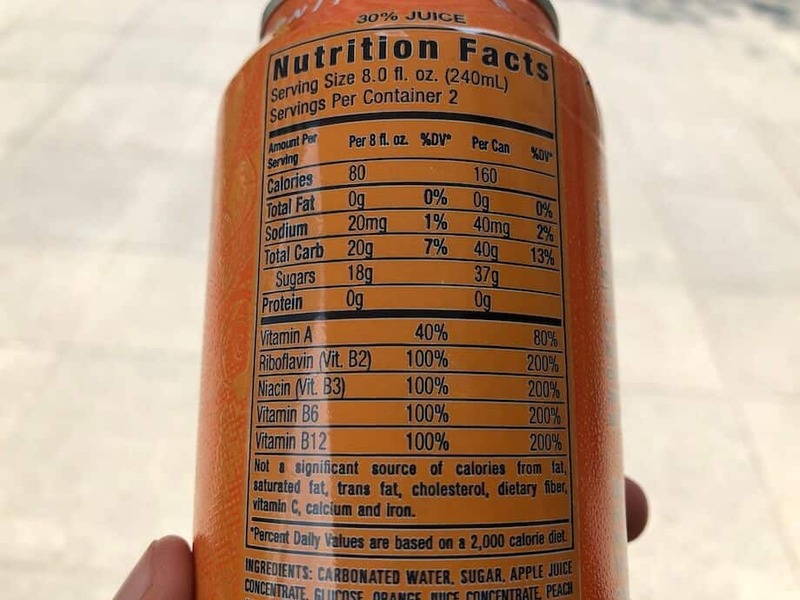 I think the juice was quite a nice addition to the drink, but I'm still quite concerned about how much sugar, artificial or natural is actually in the concentrate. If you want to have a look at some other reviews to get a better idea of the taste and effects of Monster Khaos, have a look at the following. This review gives it a 7.5 out of 10, saying that the taste was not really as good and the effects did leave much to be desired. Another review over here loves it, saying that it 'tastes like it's not too bad for you'- which is just fooling yourself, because juice isn't actually that healthy either to be honest. If you want to know more about effects, take a look at this review. Finally, this review approaches it from a workout perspective, and how it works as a pre-workout supplement. 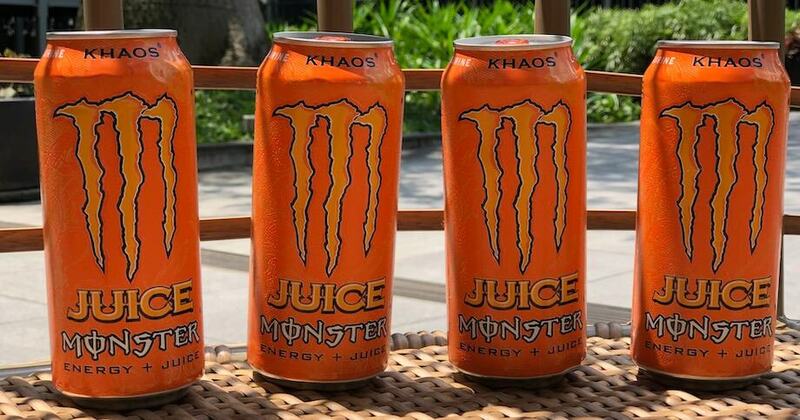 Monster Khaos's bright orange can is quite cheery, and it does immediately make you think of juice. But what hidden sugars are there within? Overall, I would give Monster Khaos a 7/10. It had a much nicer taste than any of the other Monster drinks, but a few things are holding it back from getting a higher mark. The price is a big factor- $3.80 is very nearly $4, which is really expensive when you consider that there are other, quite nice tasting energy drinks out there as well. If you're looking for something that you can sustainably consume over a long period of time, this probably isn't it. You could also take a look at Mio droplets or Vivarin caffeine pills if you are looking for something that's quick and easy to take. At 200mg of caffeine, Vivarin is around the same amount of caffeine that Monster Assault has, but without the great taste. At 50mg of caffeine, REIZE contains a lot less than Monster Import Energy, but in addition to that, it also contains some other great energy-boosting ingredients that are healthy for you. REIZE is just as convenient and versatile, since you can add all types of liquids to it- soda, hot water, cold water, flavored juice, it's up to you. REIZE ships right to your door for around $1 per drink, cheaper than Monster Khaos and most of the energy drinks on the market. Give REIZE a try today and you might just find that you prefer it to Monster Import.